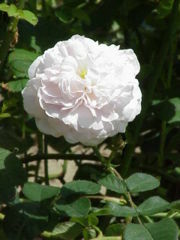 The best time to transplant roses is during late winter, after the last hard frost but before the bushes begin to bud. First, prepare the new planting site. You will want it all ready to receive your rose bushes before you take them out of their old home, so the roots don’t get a chance to dry out. Dig an adequate hole, then mix some good soil, some compost, and a handful of bonemeal together. Pad the sides of the hole with this mixture. Fill the hole half-full with water and let it soak in. Next, prepare the bushes to be transplanted. Pick a cool, cloudy day or perform the transplant in early evening. Start by pruning their top growth a bit to make them easier to manage. If transplanting from the ground, dig as large a root ball as will fit into the waiting hole and move the plants to their new home. If transplanting from a pot, trim any tangled roots so they will be able to grow out in the ground. Even if you do no trimming, expect that you will break a few roots. Don’t worry, your bush will survive, especially if you pruned it recently. You will want to be very gentle in moving the bush, however. Damaging the trunk or branches will leave your roses vulnerable to fungal disease. Once your bush is transplanted, fill any space with more dirt/compost/bonemeal mixture. Water it immediately, then cover the area with an organic mulch, such as bark chips. 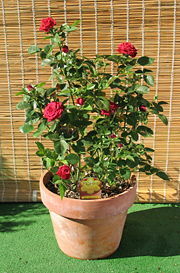 Over the next few days and weeks keep a close eye on your rose bush, watering frequently. Do not add any fertilizer until you see new growth. Once your bush is budding, you’ll know it has taken to its new home. Congratulations, and Happy Growing!